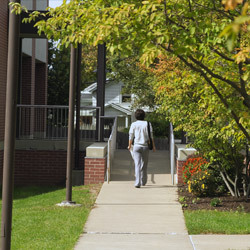 PrattMWP, an alliance between two renowned institutions, offers students a unique educational opportunity. Applying to PrattMWP is easy! In fact, we strive to make every aspect of the application, enrollment, and payment processes simple for our students and their parents. enrollment, and payment processes simple for our students and their parents. Applying to PrattMWP is easy; there are just a few steps for you to follow and options to apply. Student involvement outside of class during college is an essential element of a successful college education. 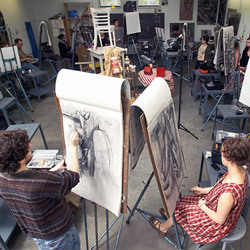 PrattMWP shares a campus with the renowned Munson-Williams-Proctor Arts Institute. 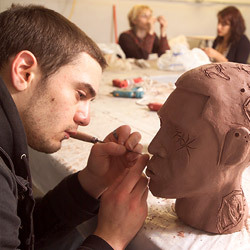 Beyond this Institute’s galleries, exhibits, and collections, students can also access MWPAI’s School of Art, a Community Arts program that offers exceptional classes and workshops to adults, teens, and children in a wide variety of visual and performing arts. 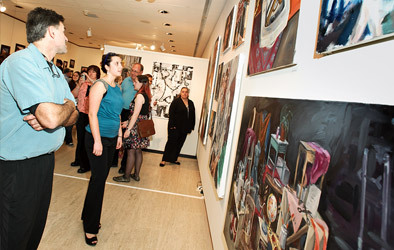 Through the School of Art, MWPAI is dedicated to enriching our city, bringing people together, and helping the arts to thrive. Art is one of those treasures. And preservation is one of the many goals PrattMWP and MWPAI are striving toward. The sophomore sculpture class has produced a group project that has been installed in Palmer Park. Professor Cindy Buckley Koren is proud to announce that work from PrattMWP’s Communications Design program has once again been recognized for national honor. The PrattMWP Class of 2018 celebrated their time at the School by donating a dogwood tree to add to the beauty of the campus that served as their home for two years. It’s no small honor to be a current underclassmen and already be recognized in a national magazine. PrattMWP Professor Cindy Buckley Koren was featured in a full-page interview, along with work from two of her students, in the June 2017 print edition of Graphic Design USA magazine.According to the editors of GDUSA, “...design education and educators have more influence than ever on the fast-changing shape of design, media and culture...The common thread is that these are people who are making a difference to their students, schools and community.”Interview available online. Posters designed by PrattMWP students Kylie Dimick (honorable mention) and Ryan Neil (finalist) are scheduled to travel around the world. This is the first in a series of short monthly interviews with sophomore Student Peers or Student Government Leaders.